Paddy Power are an Irish bookmakers who are the fastest growing online betting brand in the United Kingdom. Paddy Power's success is largely due to their heavy investment in innovative mobile products. Work on iPhone, Android, BlackBerry & Nokia. Dedicated tablet version also. Paddy Power Mobile is the most popular sports betting app in the U.K.
Live horse racing from UK, Irish, South African, South American & Dubai tracks. Full access to all Paddy Power's infamous Money Back Specials from the app. From Irish bookmaker Paddy Power comes this mobile betting app which, as you would expect from one of the largest and, on occasion, one of the most controversial, bookmakers is jam packed with features and Paddy Power’s trademark non-sports and novelty markets. Available for download on iPhone, iPad, and iPod touch, as well as for Android, Nokia and Blackberry, the app consistently garners glowing reviews and is one of the best mobile betting apps around. Probably the most impressive feature for Paddy Power punters using the app is the availability of live streaming of all UK and Ireland horse races. 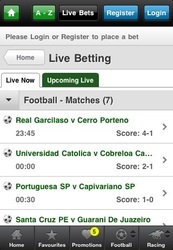 Very few bookmakers are able to offer such extensive coverage in an app. 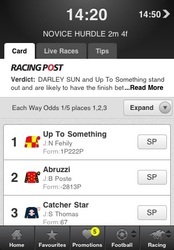 To watch a race live on your mobile simply place a £1/1Euro bet on the race in question. 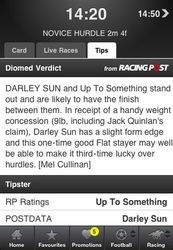 A tips section provides a nice feature in the race cards. Tips are varied and informative and come from the Racing Post. A virtual horse racing feature is available. 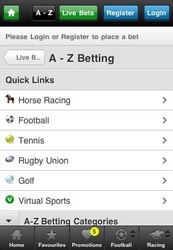 Bets can be made 24/7 and the virtual race viewed via the app. Good for insomniacs and those not enticed by the real world racing on offer. 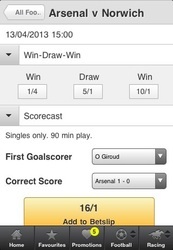 The other main feature of which Paddy Power is rightly proud is its live and in-play betting. 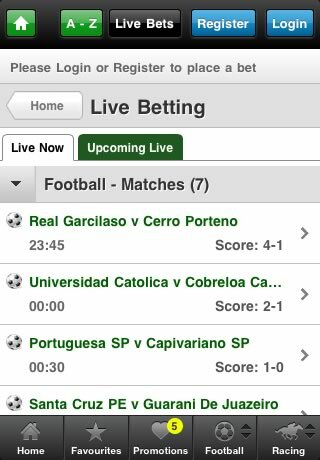 Real time betting is available on a wide range of sports from football to snooker with odds automatically refreshing and scores updating as they go. Football fans may be a bit disappointed that streaming of matches or video clips of goals is not available, but for those whose main emphasis is on betting via the app this is unlikely to be an issue. A top ten bets section gives punters some ideas of popular bets going on and a results section rounds up results from the all the previous betting markets for people needing to check the outcome of their wagers after the event. The app looks great with its trademark green colour scheme and, in fact, looks far better on mobile handsets than the bookmakers’ actual web site itself. The simplified layout, chunky font and picture design are much easier on the eye than the more cluttered website which contains many buttons and features vying for your attention at the same time. 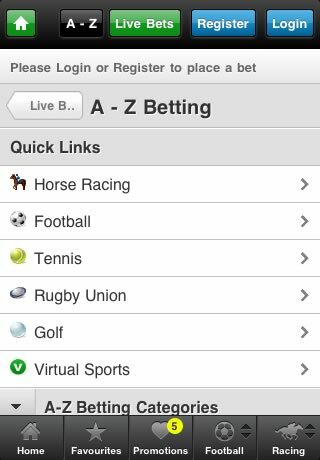 Not so the app, with live and popular bets listed down the centre of the screen and quick access buttons across the top for the most popular sports markets. Login is simple and accessed via a button on the top right hand side of the screen. Along the bottom, tabs appear as integrated buttons on your mobile handset and give the app a classy feel. One such tab provides a quick link to your most commonly bet on markets for those that are creatures of habit. Another indicates the number of promotions available and sets out the special offers on markets running at the time. Within sports tabs the app is well managed too. Races, for example, are helpfully organised showing the next races running throughout the day, with an additional tab showing all races for the following day. Future races are also rounded up in a specific tab. Football is set out according to matches for the day and contains quick access to coupons for the day’s games. 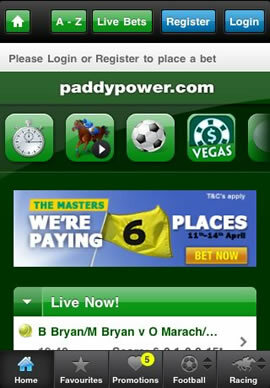 The app also links to the Paddy Power mobile poker and casino. Tabs at the top of the screen enable integration with these for those who enjoy game playing. Navigation is generally quick and trouble free and aided by the user friendly layout. A home button further assists navigation and the well-arranged screen makes for an easy to use app. New customers only, limited to one per person. If you’ve previously had a Paddy Power account, you will not qualify for the offer. Place your FIRST bet on any Sportsbook market and if it loses we will refund your stake in CASH. Max refund for this offer is £20. Only deposits made using Cards or Paypal will qualify for this promotion​. 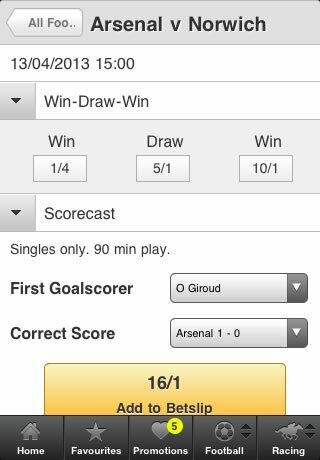 Paddy Power prides itself on offering the widest array of markets and bets around and the app is no exception. All sports markets are available to punters along with many non-sports markets. Paddy Power’s famous novelty bets make an appearance so those depressed by the weather and wanting to make a few quid can place a bet on the melting of the polar ice caps. For pessimists waiting for the coming of Armageddon, why not bet on the number of nuclear weapons tests carried out by North Korea in the next year? (Be warned though: you may not be around to collect your winnings). As you would imagine, horse racing punters are well catered for. All UK and Ireland horse races are available for betting on so if there is a race running you’ll know it will be covered by Paddy Power. A variety of special bets are also available. 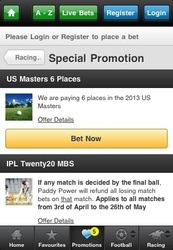 For racing aficionados not content with UK and Ireland racing, Paddy Power offers a wide range of races from America. For those not fancying a bet on any of these, virtual races can be punted on via the app. Paddy Power guarantees the best odds on all UK and Ireland races and will pay out at the better odds to anyone taking an early or board price where the where the SP return is greater. Special promotions on markets vary and are continuously updated. Money back specials and pay outs are the norm on all manner of sports. Perhaps a slightly frustrating aspect is the help and support available via the app. The Paddy Power online website provides a comprehensive section for support and account management with phone lines available both in the UK and Ireland and around the world, along with enquiries via email and Twitter. Helpful information indicating phone and email enquiry response times is also provided on the website, but sadly these features are not available via the mobile app. For those needing to contact Paddy Power whilst betting on the move, phone numbers and an email address are contained within the terms and conditions section on the app. This could definitely be improved as it takes a bit of searching in order to find the contact details and is perhaps not as handy as would be liked by anyone making an urgent enquiry for the first time about a bet on an impending match or race. The Paddy Power mobile sports app is an all-round performer combining usability with a comprehensive range of sports markets and quality features. The live and in-play betting is almost unparalleled and the live video streaming of all UK, Irish, South American and South African horse races is more than the average punter could wish for. Add in the free bet offer and various money back offers, the app is a winner for those wanting to bet on the move.